I’ve been swamped with the library project all week, so I haven’t cooked anything new and exciting in a while. I did bake 2 cakes yesterday, which I will post more about later. 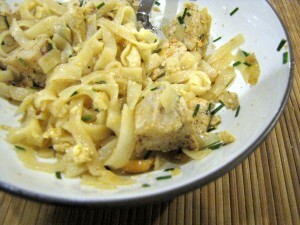 But tonight for dinner I made pad thai, which I’ve been meaning to try my hand at for ages. I switched out the shrimp in the original recipe for chicken. It was pretty delicious, but I was missing a few ingredients. I had no bean sprouts, no cilantro, and chives instead of green onions. But it still worked just fine. The recipe is from America’s Test Kitchen’s The Best Skillet Recipes. 2 Tbsp tamarind concentrate **NOTE: The book calls for 2 Tbsp tamarind paste or 1 TBSP of tamarind concentrate, which the book describes as black and thick. My concentrate was more like apple butter, so I doubled the amount of my concentrate. I wasn’t sure what ratio to use. 3 cups bean sprouts (about 6 ounces) **The store was out of this, it was fine without them. FOR THE SAUCE: Mix the tamarind paste/concentrate with the boiling water and let it steep in a bowl for 10 minutes. 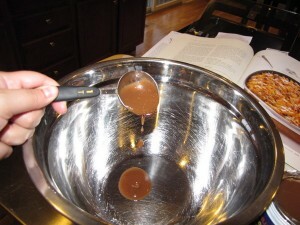 Then pour the mixture through a strainer into a medium bowl, add all the other sauce ingredients, stir, and set aside. FOR THE NOODLES AND CHICKEN: Bring a pot of water to a boil. 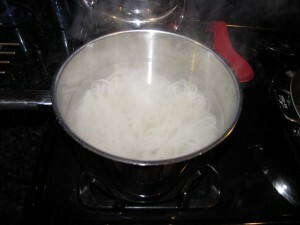 When the water is boiling, take it off the heat and add the rice noodles. Don’t boil them, just let them steep for 10 minutes in the pot of water. Stir occasionally. Toss the chicken, 1/8 tsp salt, the pepper, and the sugar in a bowl. Heat 1 Tbsp of the oil in a skillet over high heat until just smoking. Add the chicken and cook until they are almost fully cooked, about 5 minutes. Put the chicken in a bowl and set aside. 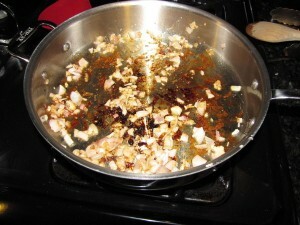 Add the remaining 1 Tbsp oil, the shallot, garlic, and 1/8 tsp salt into the kitchen and cook over medium heat. 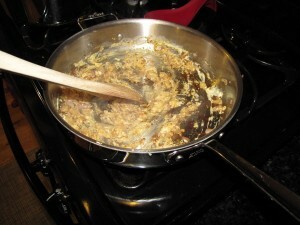 Stir constantly until golden brown, about 1.5 minutes. Add the eggs and cook, stirring constantly, until scrambled and almost dry, about 20 seconds. 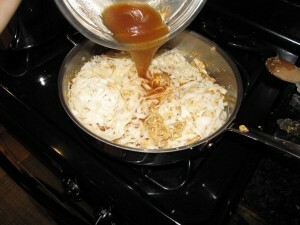 Add the drained rice noodles to the pot and toss to coat. Add the sauce, increase the heat to high, and cook, tossing constantly, for about 1-3 minutes (until the liquid evaporates and the noodles are thick and coated). Add the bean sprouts, peanuts, and all but 1/4 cup of the scallions and continue to cook, tossing constantly, until the noodles are tender, about 2 minutes. 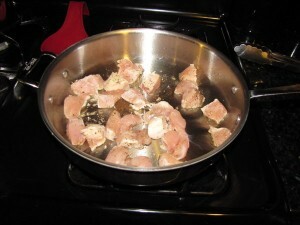 Return the chicken , along with any accumulated juices, to the skillet and cook until heated through (about 3o seconds). 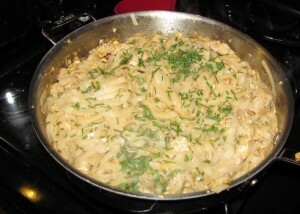 Transfer the noodles to a platter and garnish with the peanuts, cilantro, and remaining scallions. Serve with the lime wedges.